Penticton Window Cleaning | Gorilla Property Services | Call Us Now! Rain or shine; your Penticton home or business takes a beating from the weather. And nowhere is it more apparent, both inside and out, than with your windows. During the autumn and winter, they are responsible for keeping the heat in and the cold out. In the spring and summer, windows give access to the light and warmth of the sun. Ultimately, efficient windows can significantly reduce your utility bills all year round. 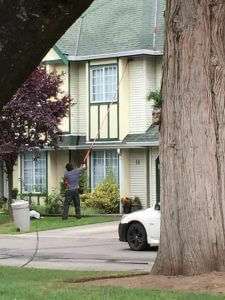 Gorilla Property Services can help with our Penticton Window Cleaning. Getting one window, both sides, spotless and streak free is a mission. An entire house worth is practically impossible; without the knowledge and tools with which we equip our technicians. 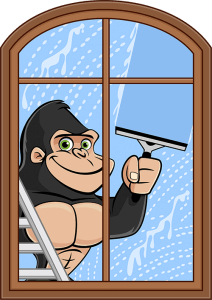 Our Gorillas are capable of cleaning any window at 3 storeys or below. Each one is done by hand, with rubber squeegees and wipe off cloths, with no streaks and no drips. You’d be surprised how agile a Gorilla can be, up a ladder, with a squeegee in his/her massive hairy hand. They even wipe down the sills! Of course, Gorillas also care about the planet. That’s why any cleaning solutions used are biodegradable. When we say our Penticton Window Cleaning Service is available at 3 storeys and below, that also includes those inaccessible spots. Places such as skylights, roof glass and awnings. With the help of tucker poles (a long pole with a brush on the end and water running through it), cleaning concentrate, heavy duty removal tools and some trade secrets, every pane of glass will be sparkling clean. As a Penticton resident, you get to experience all four seasons. Why not have an unobstructed, front row seat from the comfort of your own home without lifting a finger.